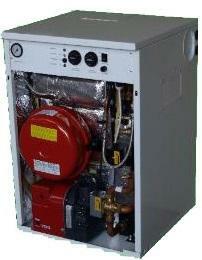 The Mega Combi Standard MC7 oil boiler from Mistral is a non-condensing, floor standing boiler. It has been designed with double thickness high quality white casing and has an output of 68kW for larger homes such as barn conversions, country homes and those with multiple bathrooms. This boiler achieves an efficiency rating of 93% making it A rated and is also available in other outputs from 41-70kW to suit other sizes of home. It is also available with condensing technology and as either an indoor or outdoor installation. Key features include the multi directional flue outlet option and pre punched pipe entry points on both sides and back enabling a quick and easy installation. This can help to save you both time and money on the cost of installation. Other benefits include the front service access, conventional or balanced flue option and the 5 year warranty from Mistral.